One of our favourite foods is pizza, and when we get a craving for it, just having pizza once won’t satisfy it! The problem is, we make a pizza, have the leftovers the next day, but then what? We are all out of pizza and have no time to make more, so we have to get creative! Often this just means things like pita pizzas or pizza bagels, but sometimes we get a little more extravagant. 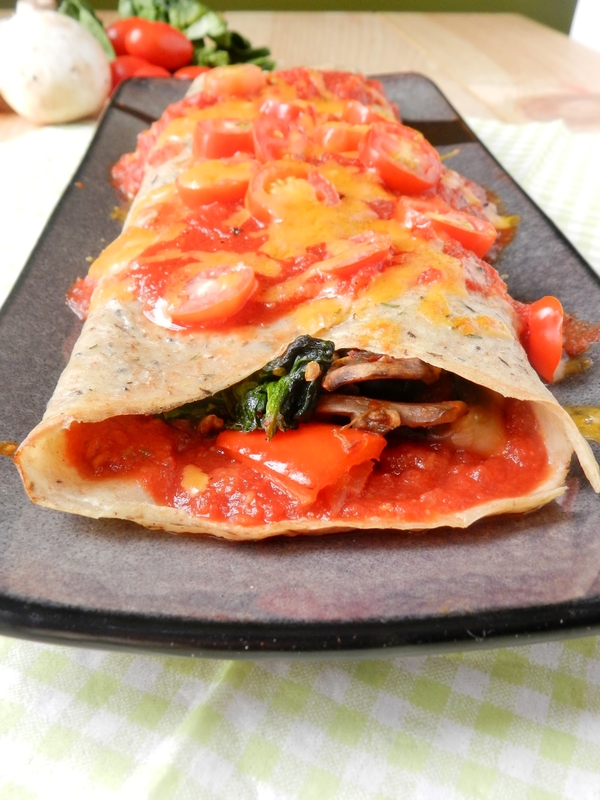 This time, more extravagant meant a pizza-crepe! 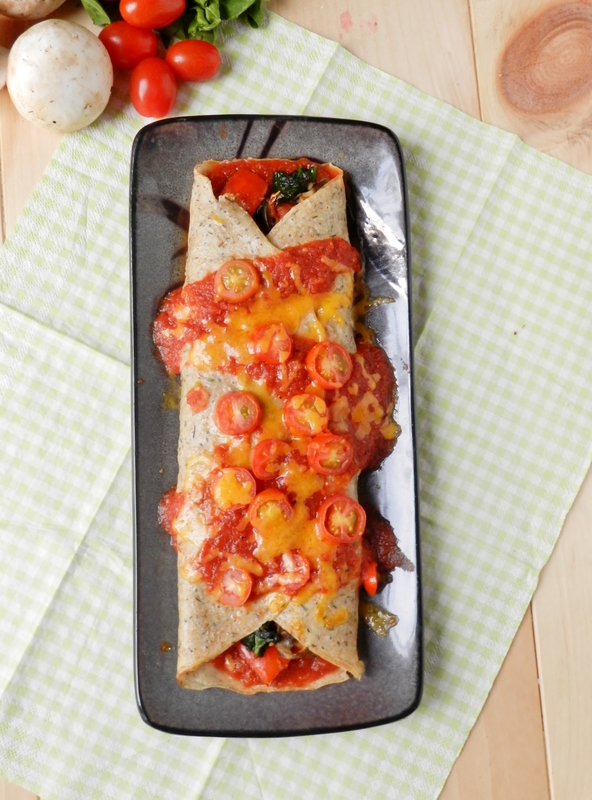 It’s a breakfast-favourite meets dinner-favourite to make quite the delicious lunch! Not that you couldn’t have it for dinner, too! Or breakfast, if pizza for breakfast is your thing. 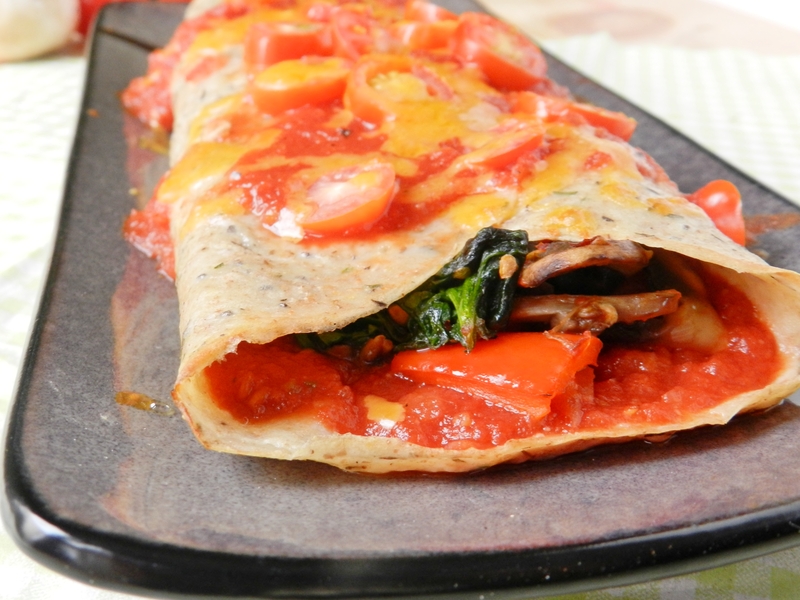 Another bonus is that these crepes are way faster and easier to make than a pizza (if you’re making your own crust), and they’re also much healthier than most traditional pizzas, especially if you were planning on ordering-in! Mix the flour and seasonings thoroughly with a wire whisk. Add the egg whites. Slowly add the stock while stirring to avoid clumps. The batter should be a thin, drippy consistency. Pre-heat a large, greased non-stick skillet over medium heat. Divide the batter in half and pour half onto the pan, swirling the batter around the cover the bottom of the pan. Cook for 2-3 min, until the edges begin to curl. Flip and cook for another 2-3min. Repeat with remaining batter. Meanwhile, in a smaller pan, saute your vegetables until they are soft. 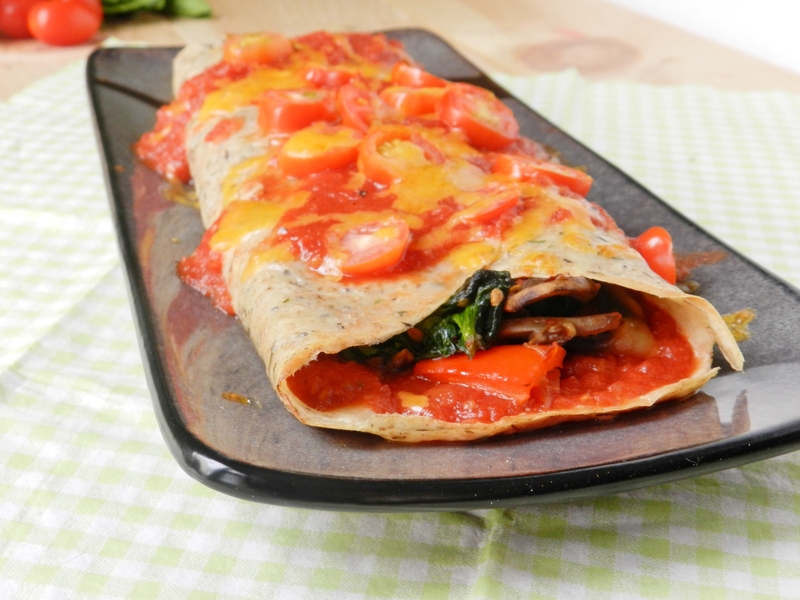 Spread pizza sauce down the centre of your crepe. Top with pizza toppings and fold. Top with more pizza sauce, additional toppings and cheese. Broil for 2-3 min until the cheese has melted. How do you conquer a craving when you can’t have exactly what you are craving? Posted in Uncategorized and tagged broil, c vegetable stock, cheese, crepe, dinner, egg white crepe, egg whites, food, food recipe, ground flax, healthy, low fat, lunch, mushrooms, olives, pita pizzas, pizza, pizza crepe, pizza sauce, recipe, spinach, tomatoes, traditional pizzas, whole wheat, whole wheat crepe, whole wheat flour. Bookmark the permalink.